朱哲, 胡沛男, 李伟明, 祖尧. 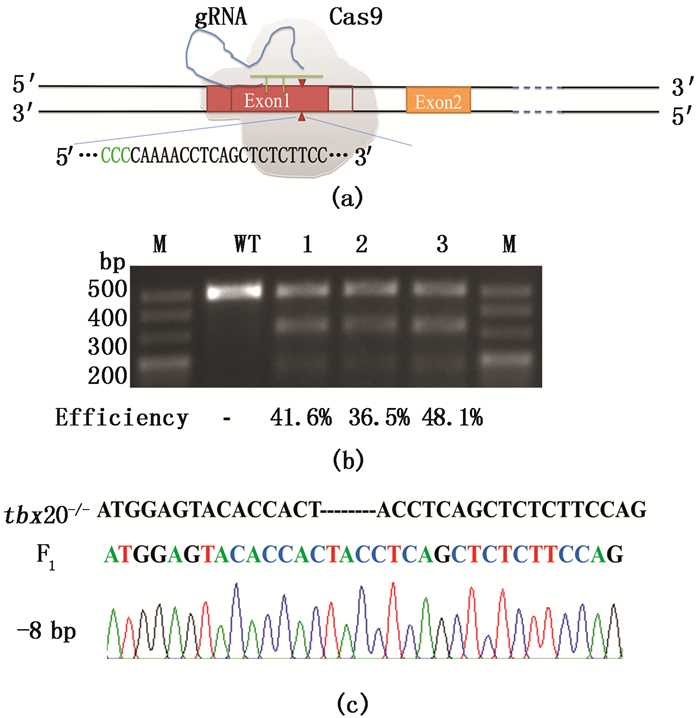 利用CRISPR/Cas9构建斑马鱼tbx20基因突变体及其功能分析[J]. 上海海洋大学学报, 2019, 28(1): 1-9. ZHU Zhe, HU Peinan, LI Weiming, ZU Yao. Zebrafish tbx20 gene knockout using CRISPR/Cas9 system and its related functions analysis[J]. Journal of Shanghai Ocean University, 2019, 28(1): 1-9. 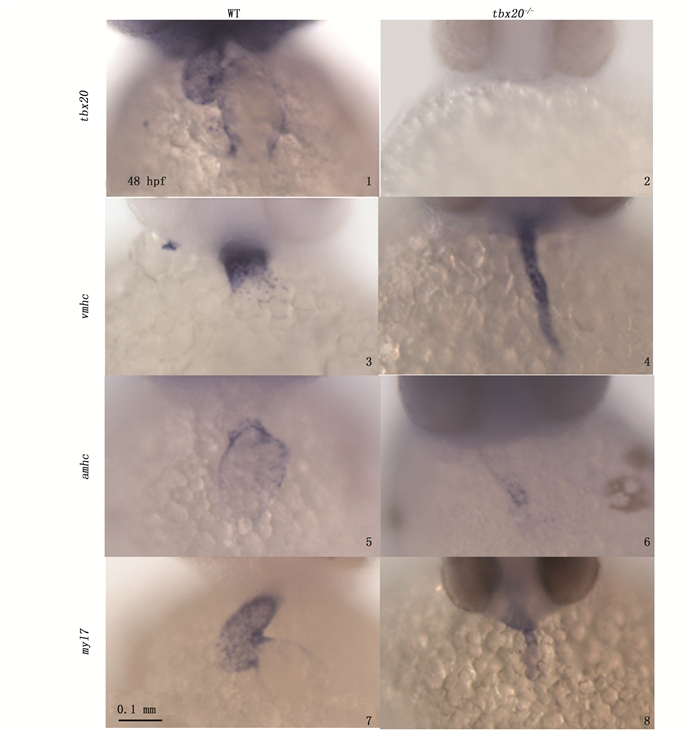 PLAGEMAN JR T F, YUTZEY K E. T-box genes and heart development:putting the "T" in heart[J]. Developmental Dynamics, 2005, 232(1): 11-20. KRAUS F, HAENIG B, KISPERT A. Cloning and expression analysis of the mouse T-box gene Tbx20[J]. Mechanisms of Development, 2001, 100(1): 87-91. 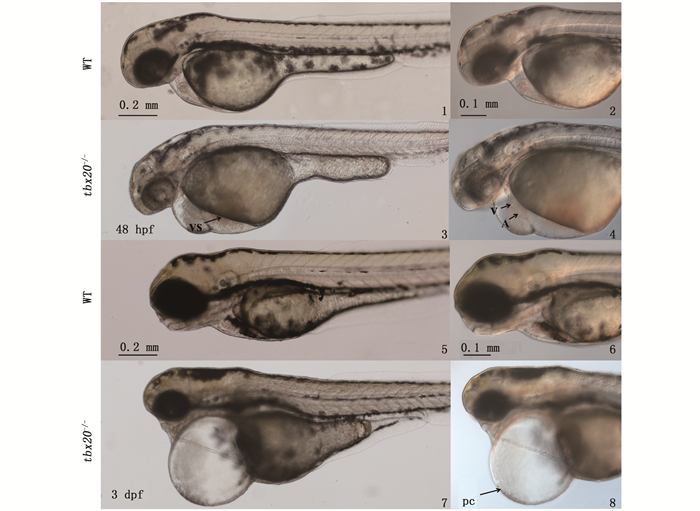 SZETO D P, GRIFFIN K J P, KIMELMAN D. HrT is required for cardiovascular development in zebrafish[J]. Development, 2002, 129(21): 5093-5101. YUTZEY K E, RHEE J T, BADER D. Expression of the atrial-specific myosin heavy chain AMHC1 and the establishment of anteroposterior polarity in the developing chicken heart[J]. Development, 1994, 120(4): 871-883. 宋美泽, 黎明, 李健, 等. 急性氨氮暴露对大弹涂鱼炎性反应相关基因表达的影响[J]. 水产学报, 2018, 42(11): 1704-1710. SONG M Z, LI M, LI J, et al. Effects of acute ammonia exposure on gene involved in inflammation of mudskipper[J]. Journal of Fisheries of China, 2018, 42(11): 1704-1710. 朱嘉诚, 贺婵娟, 贾晓会, 等. 转基因及相关亚品系鱼腥藻的纯化[J]. 上海海洋大学学报, 2018, 27(5): 645-655. ZHU J C, HE C J, JIA X H, et al. Separation and purification for transgenic Anabaena sp. PCC 7120 and its subspecies[J]. Journal of Shanghai Ocean University, 2018, 27(5): 645-655. Abstract: The tbx20 mutated zebrafish line is successfully established by using CRISPR/Cas9 system. The tbx20 mutagenesis efficiency is about 42.1% which was evaluated by T7E1 assay in F0. Sequencing analysis estimated the germline transmission efficiency of tbx20 mutagenesis is 36.7% in F1. The tbx20 homozygote mutant showed obvious cardiac phenotypes:the tbx20 mutant displayed pericardial oedema, sinus congestion, looping abnormal and the cardiac morphology deformation at 48 hpf; all the phenotypes became severer at 3 dpf and tbx20 mutant showed linear heart. In situ hybridization and realtime fluorescence quantitative PCR results revealed that the expression of vmhc was upregulated, amhc and myl7 in the tbx20 mutants were downregulated. The tbx20 mutated zebrafish line was successfully produced and was confirmed tbx20 affected heart looping, which established a foundation for future studies on the function of tbx20 gene in early cardiac chamber differentiation.